It was another special occasion for the brethren of Arthur Stanley Lodge No 3469 and their many guests. They had gathered at the Ormskirk Masonic Hall, to witness the installation of John Reed as the new WM. At the evening’s ceremony the lodge was honoured by the presence of Peter Levick as the representative of the Provincial Grand Master. Peter was accompanied by the Ormskirk and Bootle Group Chairman Graham Chambers, group vice chairman Malcolm Alexander and acting Provincial grand officers Roderick Walker and John Riley. Peter Levick (left) with the new WM, John Reed. David then asked Paul McLachlan if he would occupy the chair of senior warden, Gary Evans if he would remain in the chair of junior warden and Peter Whitaker if he would remain as inner guard for the ceremony. The presenting officer Gregory Pinnington presented the master elect John Reed, and then John was installed in a dignified and confident manner into the chair of King Solomon by David. The working tools of a master were presented by Ron Bently, the third-degree tools by Peter Whittaker, the second-degree tools by Gary Evans, and those of the first degree by John Roberts. The WM then proceeded to invest his officers for the ensuing year. The address to the master was given by Nigel Hughes, that to the wardens by Tom Newton and Peter Levick delivered the address to the brethren; all the addresses were delivered in a very sincere and confident manner. 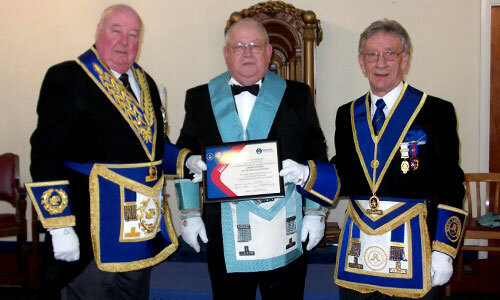 Peter Levick (left) presents John Reed with the lodge’s certificate of Grand Patronage for the 2021 Festival with Malcolm Sandywell (right) watching on. At the end the ceremony of installation, Peter rose from his chair and conveyed the congratulations of the Provincial Grand Master Tony Harrison to the WM, wishing John a happy, healthy and successful year in office. Peter went on to say that had Tony been present he would certainly have congratulated everyone who had taken part in the ceremony. He was sure he would have been thanking David Irving, Gregory Pinnington and everyone involved for an excellent installation ceremony, before wishing everyone in the lodge health and happiness in their Freemasonry. John then rose to present three cheques, £3,000 to the MCF 2021 Festival, £600 to Crohn’s and Colitis UK and £150 to Willowbrook Care Home. Peter thanked the lodge on behalf of the recipients for their very generous donations. Once the presentation of the cheques had been completed, Malcolm Sandywell, the Group Charity Steward passed to Peter Levick the lodge’s certificate of Grand Patronage of the MCF 2021 Festival, which he was delighted to present to John. 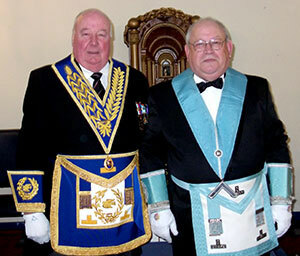 The lodge is the first within the group to achieve the status of Grand Patron. After the lodge was duly closed, the members and guests retired to the dining room for some well-earned refreshment, and a four-course meal, starting with baked field mushrooms, followed by a mixed grill, for dessert apple pie and custard was served and followed by stilton and port. During the festive board a raffle was held where £166 was raised which will be donated to charities at a later date. Pictured from left to right, are: John Riley, Graham Chambers, Peter Levick, John Reed, David Irving, Malcolm Alexander and Roderick Walker.